Luckily, Germany was awarded a penalty after the game was already over, thanks to the video technology (Game report). Now Slovenia files a protest hoping to get the match replayed. Although I like that decision I am not sure if it was a correct one. Is it allowed to call the video proof after the final buzzer went off? The rules of the Game don't mention video tech at all. Is the decision next to a red card (only within the 30-seconds rule) always a penalty if the attacking team didn't score in that situation? I believe it doesn't matter whether or not they passed or shot. No goal = penalty. But some press articles say otherwise. Since, infractions and unsportsmanlike conduct that take place before or simultaneously with the final signal are to be punished (2.4), and for situations when referees have strong doubts in relation with the last 30 seconds rule involving the red card and seven-metres throws video proof system can be used (see below). In this particular case, in the last 30 seconds of a game while the ball is in play, the opponents tries to prevent the team in possession from being able to take a shot on goal or to obtain a clear scoring chance, the guilty player is disqualified according to the corresponding Rules and the team in possession is granted a 7m throw (16:6, 14:1). So, for the last 30 seconds decision next to a red card is always a 7m throw if the player who was fouled, or a teammate, didn't score a goal before the game is interrupted. However, if the player who was fouled, or a teammate, scores a goal before the game is interrupted, the 7m throw is not be granted. So, from the article that you linked. 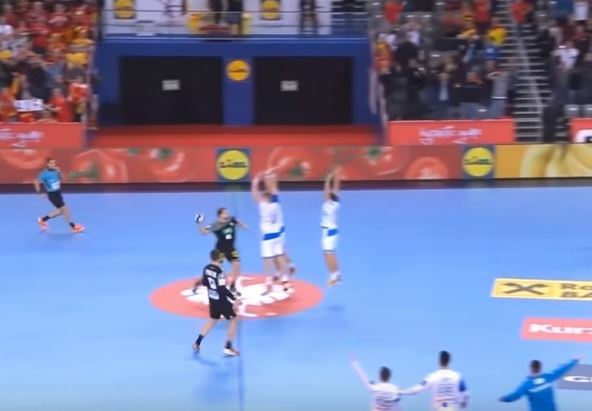 When the final whistle sounded, the video technology was called and after analysis, the decision was made that Slovenia’s Blaz Blagotinsek stopped Germany’s final attempt in the middle circle. The line player was sent off with a red card, Germany received a penalty – and Tobias Reichmann netted to equalise the final result, 25:25 (15:10). 2:3 The playing time begins with the referee’s whistle for the initial throw-off. It ends with the automatic final signal from the public clock or from the timekeeper. If no such signal comes, the referee, the timekeeper or the delegate whistles to indicate that the playing time is over (17:9). If a public clock with an automatic final signal is not available, the timekeeper shall use a table clock or a stopwatch and end the game with a final signal (18:2, 2nd paragraph). 2:4 Infractions and unsportsmanlike conduct that take place before or simultaneously with the final signal (for half-time or end of game, and also for the end of the halves in overtime) are to be punished, also if the resulting free throw (under Rule 13:1) or 7-metre throw cannot be taken until after the signal. Similarly, the throw must be retaken, if the final signal (for half-time or end of game, also in overtime) sounds precisely when a free throw or a 7-metre throw is being executed or when the ball is already in the air. In both cases, the referees end the game only after the free throw or 7-metre throw has been taken (or retaken) and its immediate result has been established. 8:10 If the referees classify a conduct as extremely unsportsmanlike, a punishment is granted according to the following regulations. prevent the team in possession from being able to take a shot on goal or to obtain a clear scoring chance, the guilty player or official is disqualified according to the corresponding Rules and the team in possession is granted a 7m throw. If the player who was fouled, or a teammate, scores a goal before the game is interrupted, the 7m throw shall not be granted. d) there is an infraction according to Rules 8:10c or 8:10d (however, see 8:10 last paragraph). 16:7 After calling a time-out, the referees shall clearly indicate the disqualification to the guilty player or team official, and to the timekeeper/scorekeeper, by holding up a red card (hand signal no. 13, see also Rule 16:8). The last 30 seconds of the game occur during regular playing time (end of 2nd half) as well as at the end of the second half during both overtime periods. The start of the last 30 seconds of the game begins when the clock indicates 59 minutes 30 seconds (or 69:30, 79:30) or 0 minutes 30 seconds. The IHF official added that the extent of the video proof system had been enlarged since 2015. "We'll use the video proof in some new cases," he said. "When referees are not sure if a player deserves a red or a blue card. "Situations when referees have strong doubts in relation with the last 30 seconds rule involving the red card and seven-metres throws. "Situations in the last 30 seconds of the match when the defending team has no goalkeeper; if the referees are not sure if the decision must be a seven-metres throw or not. "The last two cases only when the situation is crucial for the final score of the match." Not the answer you're looking for? Browse other questions tagged rules video-review handball or ask your own question.